Pet bakeries are popping up everywhere! Do you make your own dog treats and are thinking about starting a pet bakery business? Congratulations! You are embarking on a rewarding career. 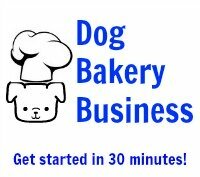 This comprehensive review gives you more than enough information to get started in your own dog bakery business. All dog treat bakery business start-ups will need the following if they are going to succeed. One of the biggest mistakes you can make is assuming that if you purchase cheaper ingredients, then you can make more money. This is just not true. It never has been and never will be. You must use quality ingredients if you want long term success. Otherwise, people may try your product once but they will not be back for more. Review what we say about natural ingredients in our discussion of trends in making dog treats as a business. You must use quality ingredients when you make your own dog treats. It is up to you to decide which market segment you want to cover. Some dog biscuit businesses make only organic treats, some use all natural ingredients, some choose to go wheat free or corn free. Only you can decide what ingredients are right for the market segment you have identified. Many beginners, and many larger bakeries in fact, rely on commercially available mixes for dog bakery treats. This is because quality ingredients can be hard to find, and if you do find them, you may have to purchase several thousands of pounds at a time. As you can imagine, this is expensive, not to mention, where are you going to put it when 10,000 pounds of flour arrives at your door? Now, you can certainly find good ingredients at your local health food market or specialty food stores but those ingredients can be pricey. So much so that you may spend so much on your ingredients that you cannot make a profit on your biscuits. One good option is to purchase a commercial cake mix for dogs. These are made by companies that purchase large quantities of quality ingredients and pre-mix them for you. All you do is open the bag and follow the directions, just like a cake mix for people! And, in some cases, you can purchase wholesale mixes for dog bakery use and get price breaks starting at only a few pounds of product. 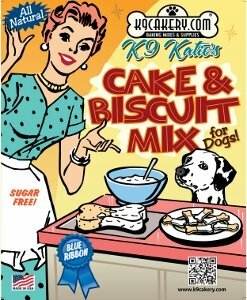 The best place to find a dog treat biscuit mix is K9Cakery.com. Every successful dog biscuit business must work from quality recipes. There are as many recipes for dog treats as there are for people cakes. Dog owners are very conscious about what they feed their dogs because dogs have become part of the family! When you make your own dog treats, please make sure you check the list of dog treat ingredients to avoid (dogs and chocolate) and become familiar with these. Your customers will certainly be well-versed themselves! A good place to start for healthy dog treat recipes is to just click the link. Dog bone cake pan and other dog themed cake pans - you can find a large assortment of paws and dog bones in various sizes at K9Cakery.com. You may make wonderful, nutritious, healthy, pretty, great tasting treats but if you plan to deliver them wrapped in aluminum foil or plastic wrap, you might as well not go into the dog biscuit business. Consumers and retailers demand professional packaging. But this does not mean that you have to spend thousands of dollars on custom made packing. There is a certain comfort people get from a package that says "mom and pop dog treat business;" not literally, but by the way it looks. Professional but not corporate. The good news is that there are many low cost dog treat packaging options. Business labels are also important for pet bakeries and should look professional as well. Pet bakeries cannot make their own dog treats and expect to sell them by written descriptions only. You must, must, must have a beautiful sample to show. The difference is that in the first case, you have to get someone's attention and then have them try to visualize what you are describing. In the second case, they will see the treat and ask "where can I get that?" Pick your best samples and let people see, touch, squeeze, sniff and whatever else they want to do in order to satisfy their curiosity and decide that your product is right for them. Okay, we know that this sounds scary to some people but it is really quite simple. You can start with a pad and a pen if you need to but you must keep full information on all of your contacts. At a minimum, have their name, business name, position, telephone, fax, email, mailing and business addresses. Also keep notes on your contacts with them. Then follow up! A better option for pet bakeries is a computerized database because it lets you search the database, set reminders, print mailing labels, send emails, etc. If you have a Mac or a PC, most basic office software has a contact database such as Microsoft Outlook. And finally, you are in the dog biscuit business to make money aren't you? Well, you can't do that if you don't keep track of your income and expenses. Again, you can do this on paper, but come on, how many people take the time to balance their checkbook? If you are the type who does, then this may work well for you. If not, you can rely on computer software for help. A low cost and easy accounting software is Quicken Home and Business. This software will give you graphs and reports that will help you track income and expenses, pay bills and keep things orderly. If your dog biscuit business really takes off and you want to track invoices and get a bit more sophisticated, then you may want to look into software like Quickbooks. Whichever way you choose to go, stay organized! You will avoid late fees and overdraft fees, you will not forget to collect on invoices and you will control your expenses. And, even more important, you will be thankful at the end of the year when it comes time to pay taxes. Due to the ubiquitousness of Facebook, you should consider a business Facebook page. Also sign up on Twitter and Pinterest.